New Police SWAT Boats Ready for Duty! Ocean Craft Marine has delivered the first two boats on an unlimited quantity contract for the supply of high performance and fully equipped Police boats for SWAT Team Use. The first two RIBs delivered were of 8.0m and 9.5m size, are designed specifically for the most intensive professional use. They are extremely agile, responsive and perfectly equipped to fulfill multi-mission operational requirements. These RHIBs were equipped with stand-up double consoles, raised windscreens and Stainless Steel grab rails. 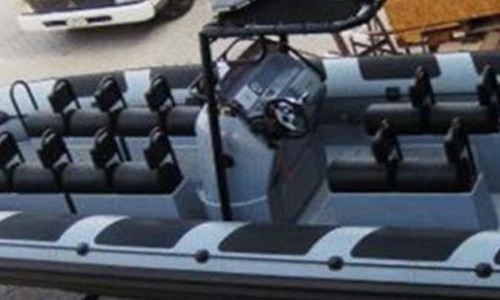 These Police Craft are also fitted with multiple double bucket Straddle Seats. The craft are powered by twin Mercury Verado® 300 HP OB motors, the 8.0M and 9.5M SWAT boats have a top speed of 63 mph and 70 mph respectively. Ocean Craft Marine now offers its full Recreational/Leisure Product Line-up in the USA and is proud to introduce its newest exclusive Dealer: Performance Tenders USA, LLC located in Fort Lauderdale, Florida. View our latest YouTube® Video with some heavy weather action.